Little Wilma Rudolph was born prematurely on June 23, 1940 in St. Bethlehem, Tennessee. She came into this world weighing a mere 4 1/2 pounds. She spent the early years of her childhood in bed battling double pneumonia and scarlet fever. When she was 6 she was afflicted with polio. This disease caused her to lose the use of her left leg, so she was fitted with metal leg braces. One day Wilma asked her parents: Will I ever be able to run and play like the other children? Her mother responded: Honey, you only have to believe. You have to trust in God because with God all things are possible. If her story ended when her being a cripple, it would be understandable, but Wilma was determined to turn her tragedy into triumph. She believed God could make it happen; and, by the time she was 9 years old, she was out of the braces and quic kly becoming a star on the basketball court. Wilma’s hard worked transformed her into a 5′ 11″ lightening fast runner, and she went on to win 3 gold medals in 1960 at the Rome Olympics. She retired from running when she was 22 years old. She turned her focus to coaching women’s track teams and encouraging young people. 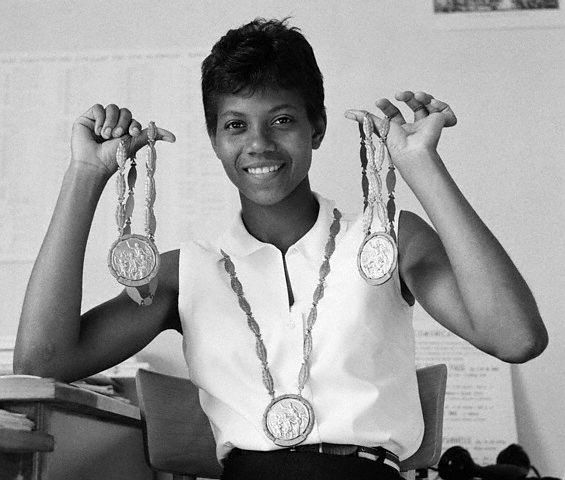 Wilma used her talent and fame to establish the Wilma Rudolph Foundation to assist young athletes in reaching their academic and professional goals. Here’s a thought to keep you thinking. Talent is God-given, so be humble. Fame is man-given, so be thankful. Conceit is self-given, so be careful.